When I first took interest for country style bread baked in a wood fired oven, I asked my neighbor that I barely knew to teach me the secrets of the trade. I was after the type of bread stored in my childhood memories that tasted much different from the bread I eat today, even if baked in wood fired ovens. Dona Rosa, then, told me that her sister who lives several miles away had “yeast in a bottle”. A few days ago,I put in a bag a package of cookies, flour and sugar (these were to be given as gifts), picked up Dona Rosa and headed for her sister´s house. She lives in a very small rural community of dozen homes in a rather scenic route. I used to drive this road while taking “Pro-Milk”, a course to learn how to work with milking cows. We were greeted by four women, an elderly lady, two middle aged women and a teenager. The older lady is Dona Rosa´s mother who is already a greatgreatgrandmother. Dona Rosa herself turned a greatgrandmother at the age of 50. Anyway, we all seated on the sofa and they talked about people’s state of health. I tried to be interested but my mind wondered on how soon I was going to see the starter. I noticed that the wood looked grungy, as my mom used to say the wood houses always look dirty and dark. Sometimes it holds a smell. At certain point, the lady announced that she would make some coffee and disappeared into the kitchen. About thirty minutes later, she invited us to sit at the table. She served us two plain deep fried dough. Davina said that the first one was made of flour, water, and baking powder. 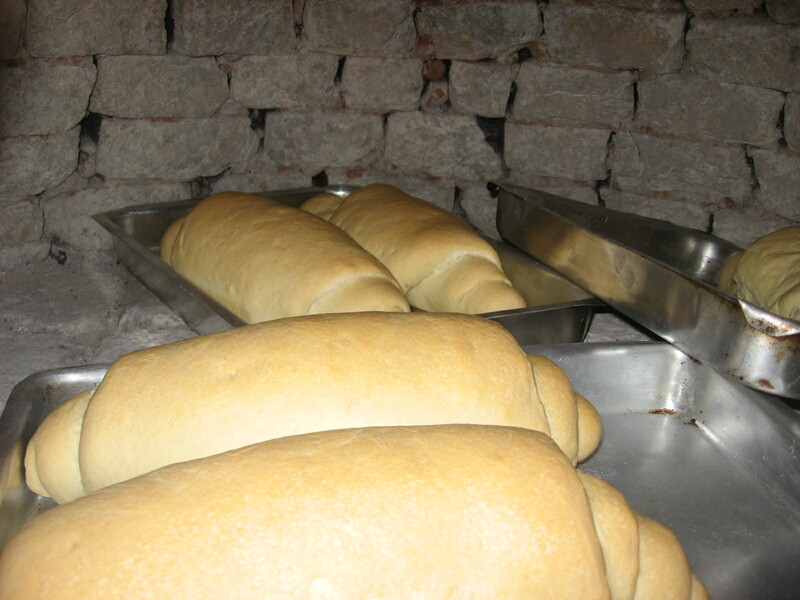 The second one was made with sourdough starter, “so I could see the difference”. Anything fried makes just flour and water taste delicious. Some were puffed up, but they had no filling. Over an hour and still no signs of the starter. Only when everybody was finished, included some family members that joined us later that Davina took the prized starter from the fridge, kept in a 1 liter coke plastic bottle. About one inch of flour on the bottom, and 500 ml of liquid. It was inert, no bubbles or foam. It looked flat and watery. She gave me the recipe to feed the starter: 9 tablespoons of flour, 3 tablespoon of sugar and 1 teaspoon of salt. She omit the type of spoon, so on my first experience, I added too much salt. The great day came; I treated my starter, took half for the bread, and kept half in the fridge. The bread recipe was 2 kg flour, 500 or 600 ml starter, less than a cup of oil, some water, sugar and salt. The dough came out very stiff, but I didn’t know how it was supposed to be. So I added more starter and oil. I left the dough rest for the night, punched it down next morning, put stretched the dough with a hand roller, and free formed them. Another few hours until they went to Dona Rosa’s wood fired oven. The bread smelled like sweet yeast (if this thing exist), it tasted slightly sour, but not quite like California sourdough bread. The density and the texture, besides the pale color of the crust, definitely I can tell that I have reproduced the bread of my childhood. The bread became better with further bakings, and I have used the starter to make deep fried dough and also pizza crust. I thought to be a mix of tough and chewy crust, but the taste had character. Something to become addicted to. The next day, I heated over a dry pan and the crust became crunch and even more delicious. I am still to try sourdough pancakes and guava paste filled fried dough. Yeah, I dumped my two other starters I had made at home from scratch. They were too sour, almost offensive. To taste, the “yeast in a bottle” is sweet and mild. Interestingly, it rises better in a tall narrow container. When kept tightly closed in a bottle, at the opening, it may burst like a champagne. How fun!